Mouser Electronics, the industry’s leading New Product Introduction (NPI) distributor with the widest selection of semiconductors and electronic components, has been honored with the prestigious Global High Service Distributor of the Year Award for the fourth consecutive year by TE Connectivity (TE), a global leader in connectivity and sensors. Mouser also was recognized by TE as their top customer growth leader and top NPI distributor. The annual Electronic Distributor Awards were presented to Mouser executives at TE’s recent Global Distribution Summit. 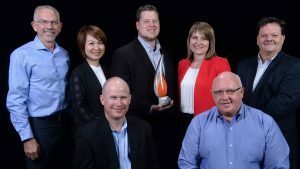 The Electronic Distributor Awards recognize TE’s highest-performing distribution partners based on sales growth, market share growth, customer growth and business plan performance. Mouser successfully grew its TE business, outpacing overall company growth rates in key categories, including sales, customer count and pieces per customer, which ultimately increased their TE commercial connector market share. With continued strategic inventory investments and SKU count expansion, Mouser further improves its ability to support engineering needs. Mouser stocks a broad selection of TE products for industries and applications, including automotive, industrial, harsh environments, data communications, consumer devices, and aerospace and defense.To learn more about the newest TE products available from Mouser Electronics, visit www.mouser.com/TE-Connectivity.